Authors: Rebecca M. Holmes et al. Space is a mess. From communicating with people all over the globe to navigating the roads, we have slowly become reliant on the use of satellites in our daily lives. They make us safer and more connected, which means it is no surprise that we’re launching more and more each year. However, between retired payloads, rocket bodies and other fragments, space around Earth, is becoming increasingly cluttered. 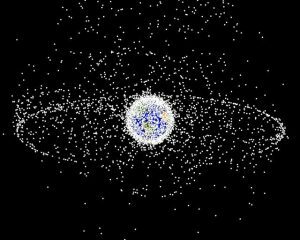 With more than 16000 objects currently being tracked*, space junk is clearly a massive problem, but dealing with it is not what the authors of today’s paper tackle. Instead, they focus on how to track objects in the first place. It’s much easier to lose a satellite than you might think. To be confident of a satellite’s position, and to be a member of the Space-Track catalogue, it must be tracked continuously from launch in order to maintain what’s known as its track custody. 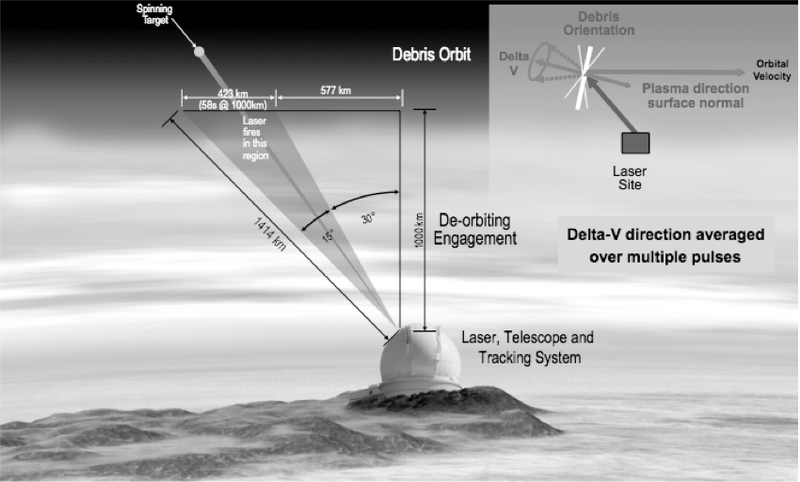 Satellites are typically tracked using radar techniques from ground-based telescopes but sometimes require bulky, power-draining radio beacons. Sadly, if the Sun is more active than usual, or the satellite’s path becomes confused with another, communications with the satellite can be interrupted. Relocation is not an easy task — even for the likes of NASA, who only recently reestablished communications with their IMAGE satellite after 13 years of silence. 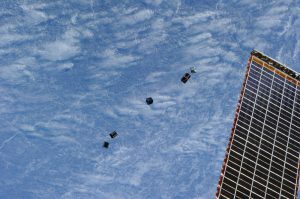 Moreover, with the ever-increasing popularity of miniature satellites like CubeSats being launched simultaneously by the hundred, it is impossible to track individual satellites as their payload doesn’t allow for a beacon. Introducing ELROI, the Extremely Low Resource Optical Identifier beacon — otherwise known as the world’s flashiest license plate. The basic concept revolves around a tiny, stamp-sized optical beacon utilising short pulses of laser light as a unique ID number, which can then be detected by anyone with a small telescope and photon-counting detector. Figure 3: An overview of the ELROI set up. The small laser flashes its unique ID, which is then filtered (red) before reaching the single-photon detector green). Figure 1 from Palmer at al. 2018. Figure 4: The bandwidth of the laser is less than 1 nm wide, and emits pulses with a decay time of 2000 ns. Pulses occur every 0.5 ms to form 1s and 0s, where a pulse represents 1 and a non-pulse, or off, represents 0. Figure 2 from Palmer at al. 2018. The laser emits pulses of monochromatic light to form a unique ID based on a string of 1s and 0s, where a pulse translates to a 1, whilst a non-pulse is representative of 0. As the time between pulses is known (0.5 ms), if the single-photon detector acquires a signal which is out-of-sync with the rest of the data, it is instantly rejected. 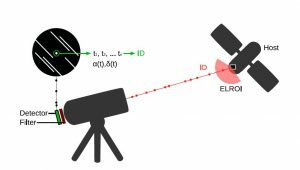 Because this data analysis technique rejects 99% of all photons, it is possible to recreate the ELROI signal from one overhead pass of the satellite, even if only a few photons are detected — meaning ELROI will be able to identify a satellite within a few minutes. Figure 5: The laser diodes of ELROI in action during pre-launch testing. The silver material is anti-static. Figure 4 from paper. After passing several ground-based tests, ELROI is now a real-life, space-ready prototype which is currently scheduled for launch into space next month (May 2018). Not only is this very exciting, it also represents the next big step for a potentially vital piece of technology. ELROI lays the groundwork for what could become standard beacon technology for small satellites and things like rocket debris. So, although ELROI doesn’t help with our current space junk problem, it will at least make it easier to track new objects in the future. *Check out an awesome satellite viewer here. Because what could be better than space lasers? Why isn’t Iapetus inclined to be eccentric? The Next Transit Hunters Making Mountains out of…? How is aiming accomplished? Obviously lasers are highly directional, and even with what looks like a diffuser in front of it, it’s still going to be visible less than half the time, barring some kind of (expensive/heavy) aiming mechanism. If that half happens to be during the daylight half of the orbit, the technique will be useless, right? I am one of the authors. The diffuser is designed to spread out the light over (almost) a hemisphere. To improve the chances of reading the ID, beacons can be put on opposite sides of the spacecraft, so one of them will (almost) always be visible. Alternatively, since uncontrolled satellites* tend to tumble, usually with less than a minute of rotation time, you can stick it on one side and let its natural rotation make it likely that you will see the beacon for enough time during a (multi-minute) overhead pass. The ID reconstruction algorithms are robust enough that, e.g. if a 10 second rotation rate means you see the beacon for 4 seconds, then nothing for 6, over and over again, you can still identify the spacecraft. If you don’t see it on one pass, you can wait 90 minutes and look at it on the next pass, which will have different viewing angles. Part of the concept is that this isn’t a ‘100% guaranteed, works-every-time’ system. Instead it is a ‘we don’t know what that is, let’s observe it until we identify it’ system. If you can identify the satellite 80% of the time on one pass, then (assumption assumption assumption) 3 passes will give you 99% reliability. After you have identified the satellite, you keep track of it the old-fashioned way–except that you don’t have to be quite as careful (expensively scrupulous) about maintaining track custody. You can recover from losing track of things more easily by re-observing the ELROI. *Controlled spacecraft: you stick the beacon on the side that is most often controlled to point at Earth. Very long thin objects can get tidally locked so that one end points always away from Earth–but you stick the beacon so that it emits perpendicularly to the long axis and then it is more random again. Thank you, David! I appreciate the clarification.